David Nieper fashion house in Derbyshire is celebrating the second anniversary of the opening of its cutting factory in Alfreton. In 2015, the company invested £750,000 in the new facility to help increase production through investment in state-of-the-art new technology. Today, after being operational for just two years, the team has already cut over 325,000 luxury fashion garments using fabrics stretching over 400 miles – the distance between Alfreton and Paris – one of the company’s biggest export markets! In 2015, a team of 16 launched the new cutting factory. Today the team has already doubled in size with additional skilled fabric cutters, skilled pre-production sewing machinists and a skirts and trousers sewing team all working to keep up with international demand for the exclusive David Nieper collections. 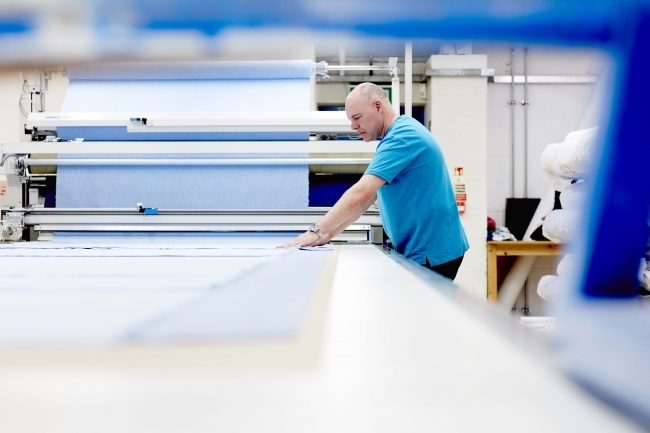 Excellent garment ‘fit’ is an essential element of fashion design and manufacture and David Nieper’s precision cutting technology cuts each piece of fabric meticulously to size, ensuring a perfect fit for customers. Similarly, beautiful fabric is another reason why David Nieper has retained loyal customer for many years. The fabric and cutting teams are specialists in textile treatment techniques such as fabric relaxing, this ensures fabrics are in the optimum condition for sewing before they are passed to the company’s dressmakers. The practices of fabric relaxation, painstaking examination and precision cutting all ensure that each component required for making a luxury fashion garment is perfectly finished before it is passed onto the sewing rooms, to undergo the next stage in the fashion production process. Each David Nieper garment is made from first sketch to final stitch in Derbyshire using the high quality fabrics.